An updated Audi A6 arrives on the market, but its two diesel engines are not currently available. That said, what’s left is a compelling choice in the competitive midsize luxury sedan segment. 2016 Audi A6 (copyright Audi of America). When the Volkswagen diesel scandal erupted last September, the fallout was destined to reach well beyond the eponymous brand. Audi and Porsche were also caught in the crosshairs, two very special marques contained within the vast Volkswagen Group collective. For Audi, not being able to sell diesel engines put it at a distinct disadvantage to its two top competitors — BMW and Mercedes-Benz — as both German nameplates sell diesels worldwide, including in the US. Two turbo-diesel engines, a four-cylinder displacing at two liters and a V-6 displacing at three liters were pulled from the market. This writer has driven both and has always been quite pleased with the performance as well as with the fuel economy that they offer. Volkswagen and its consorts cannot sell diesels again until a long-awaited fix is submitted to and accepted by the EPA and California’s Air Resources Board. That “fix” is still pending — no one really knows when it will take place. Audi may find itself sitting out the 2016 model year with not one diesel to offer. Fortunately, there is also positive news for this luxury brand: fuel prices have drastically fallen, thus the diesel fuel economy advantage isn’t as important when gas prices are below $2 per gallon. The other plus for this automaker is that it already has some exceptional gas-powered models available. Indeed, one such model was a recent weekly driver, the 2016 Audi A6 2.0T Quattro. As you might guess, the “2.0T” represents a 2.0-liter, turbocharged four-cylinder engine making 252 horsepower and 273 foot-pounds of torque. The other engine choice for 2016 is a supercharged, V-6 engine making 333 horsepower and 325 foot-pounds of torque. All models except the base front-wheel drive grade are paired with an 8-speed automatic transmission. Front-wheel drive models are paired with a 7-speed automatic. The Audi A6 is a middle of the pack luxury sedan, situated between the Audi A4 and A8 in the brand’s sedan hierarchy. The sedan’s competitors include the Cadillac CTS, BMW 5 Series, Jaguar XF, Mercedes-Benz E-Class, Infiniti Q70, and the Lexus GS. Were it a mainstream model, it would be considered a full-size sedan. And yet this model sits on a 114.6-inch wheelbase, providing 112.1 cubic feet of cabin space, more than enough to seat five adults in comfort. Audi administers a united visage across its model line. All four sedans — A3, A4, A6 and A8 are virtually indistinguishable upon first glance, giving the consumer who pays $32,000 for a base A3 the same privileged look as the car shopper who plunks down more than $90,000 for an Audi 8L. Yes, there are differences in front fascia sculpting and lighting choices, but those are relatively small. The Audi A6 features a large, open grille with sporty headlamps accented by LED lights. On either side of the lower portion of the grille are distinctive embrasures housing the LED fog lights. A long, creased hood completes this model’s frontal presentation. Multiple character lines and body sculpting graces this sedan’s profile. Soft arched wheel wells, fashionable alloy wheels and an ever so slightly rising belt line and a gently sloping roof line are also present. From the rear, a trunk lip spoiler, wraparound combination lamps, chrome garnishment, and dual exhaust ports are present. Inside, the Audi A6 rocks the senses — if that statement sounds dramatic, consider this: the A6 smells pleasant. And not the usual synthetic new car smell — a light and entirely pleasing perfume aroma resides within the cabin and, no, it isn’t something a previous journalist spilled on a seat. That gentle aroma along with a clean, but elegant dashboard, high quality materials and superb fit and finish are the top attributes for this sedan. All models come equipped with an MMI infotainment system, what acts as the nerve center of sorts for this model. A dash-mounted pop-up screen displays the menus with clarity, even when the sun is shining directly on it. Buttons and knobs located on the center console manage same. One ongoing beef I’ve had with Audi is over its smartphone connectivity, but for 2016 I am happy to report that a pair of proper USB ports are now found in the front seat storage compartment for this model. Previously, Audi supplied cables for connectivity, but those cables were never the right one for my iPhone. Now, all you need to do is bring your own cable and plug in. 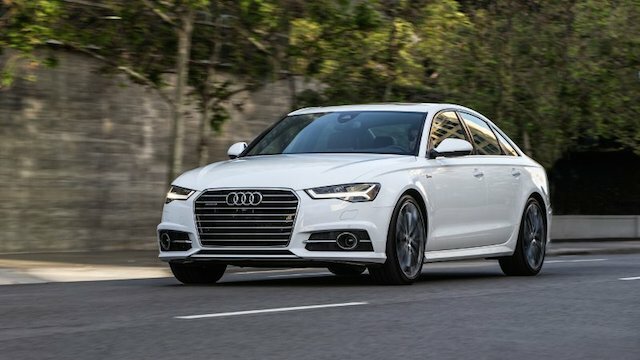 Audi also upgraded the MMI system to serve as a 4G LTE mobile WiFi hotspot, providing connectivity for up to eight devices. Google Earth data is now tied in with the navigation system, already one of the better systems on the market. The driver and front passenger are treated to plush seats, with cosseting the provision. Take that long journey and you’ll have little concern for back fatigue. Rear seating passengers enjoy excellent head, shoulder, hip and legroom. Both outboard seats fold, providing access to the trunk. Step on the gas and this sedan pulls away with confidence, with the turbo providing a near seamless boost early on. You may insist that a much larger engine is under the hood, but in displacing at just two liters this motor provides all the power most buyers will want. Most Audis reside on a front-wheel drive platform with Quattro all-wheel drive available and the smart choice by far. While some rear-wheel drive purists would never consider an Audi for that reason, the Quattro system may be the best out there. Its a permanent arrangement, meaning it is always at work and for that reason you can navigate the twisty roads with confidence. Perhaps this model’s only shortcoming is its steering feel — as in disengaged. But that’s something only the most discriminating enthusiasts will see as a demerit. Everywhere else, this luxury sedan shines, from its elegant, yet sporty exterior to its bright and carefully constructed interior. Finally, if optimum power is what you want, then the performance Audi S6 and its 450-horsepower, 4.0-liter V-8 engine is the way to go.